Trust our family owned and operated business to keep your garage doors accessible and convenient. If your garage is used for anything more than storage, a manual door is probably not practical. A garage door operator and remote allows you to open your garage door quickly, easily, and without having to get out of your vehicle. Whatever your electric garage door operator needs, you can trust the over 45 years of experience behind our fully licensed and insured team to provide dependable, affordable solutions for your garage door needs. 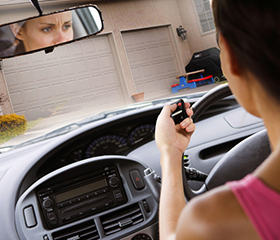 A reliable garage door opener makes your garage door more convenient and easier to use. Look to us for a variety of options to customize your system. Just like your garage doors, your garage door opener and remote should be tailored to meet your specific needs and preferences. Feel free to give us a call to talk about your needs. Let us explain the various options to you so we can help you choose the accessories that are right for your needs.